Cochenille Stitch Painter Gallery displays creations made by Susan Lazear. 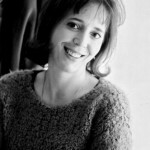 Susan is the the owner and software designer of Cochenille Design Studio. Click here for more information on Susan’s Many image reference back to her blog. View the slideshow below to get an idea of what can be created using Cochenille’s Stitch Painter software. This grid-based design software can be applied to both hand and machine knitting, crochet, beading and stitchery. For other examples please view additional galleries created by personal and professional clients of Cochenille. The Cochenille Signature Coat - Machine Knit, Jacquard. 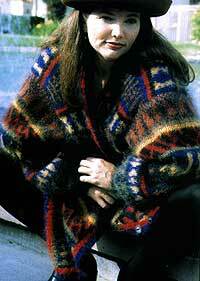 This jacket was created by scanning Susan's business card which has the Cochenille logo of the beetle. The stylized scales of the beetle were incorporated into a pattern for the sleeves and back yoke. The beetle appears on the back of the garment and the Cochenille name appears on the front of the garment. Knit by Cochenille user, Jean Blood. Medieval Times - Machine Knit and commercial fabric combination. Sewn. Wool yarn, Cotton velveteen. This jacket was designed based on vertical knit weave panels which utilizeds a hand-painted yarn. The knit panels were sewn to velveteen tipped wedges which created a swing coat silhouette. Coordinating hood and sleeves were also incorporated. 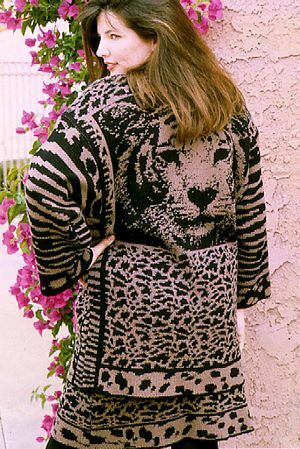 Wild Things - Machine Knit, Jacquard. Wool, rayon, acrylic yarn. This jacket and skirt ensemble was created using scanned images from the San Diego zoo and National Geographic. The silhouette was planned in Garment Styler/Designer and then laid into Stitch Painter. The garment was space planned, and then scanned images were pasted into the appropriate locations. Zebra, tiger, leopard and cheetah skin markings were utilized. 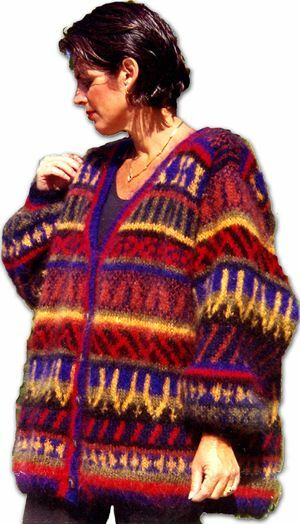 The ensemble was machine knit on a Brother 940 using wool, rayon and acrylic yarns. Knit by Cochenille user, Jean Blood. Winter Warm - Handknit, Mohair yarn. This sweater was designed using Stitch Painter and the 'Repeat in Selected Area' function. Colors were mixed to match the yarn colors chosen and a 12 stitch repeat was used to build the pattern strip by strip. Color experimentation was simple and fun. Hand knit by Cochenille user, Joline Gesino. Yorkshire Mills mohair yarn. Purple and black wool sweater coat with kimono silhouette. Graphic images were scanned and imported into Stitch Painter. The stepping stone sleeve was also planned in the engineered file so the garment could be cut and sewn once knit. Matching beret. Yarn is from Black Sheep Co.
Navy and cream cotton yarn. 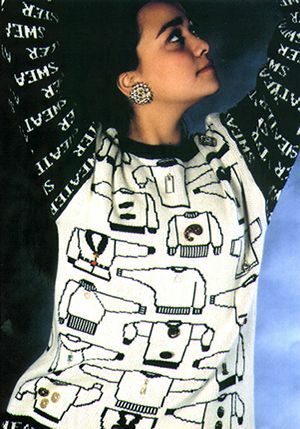 Imagery of various sweaters were laid in place. The word 'Sweater' was typed and used for the sleeves as well as a border on the bottom of the sweater. Knit on a Studio 580 electronic machine.